At Apache River Station, the passengers of a stagecoach, the owners of the station, a sheriff and his prisoner and a few ferry passengers are besieged by a band of renegade Apaches. He was a target for every man's bullet ... and every woman's kiss ! Tom Cloud: I think you know who killed Juan. Sheriff Elmer Gall: All right. It was you who horned into this valley when there wasn't room for you. Tom Cloud: I made room - about fifteen mile! Sheriff Elmer Gall: Yeah, and if you expect me to hold onto it for you, you can go rope a duck. Tom Cloud: I don't expect anything from you. I came here to report a murder. And that's the last I'll hear of it. Sheriff Elmer Gall: I'm not so sure. I'm getting pretty sick of the trouble you bring on. Tom Cloud: Trouble? You don't know the meaning of the word. 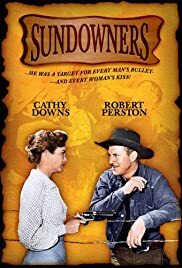 Despite having everything in its favor, "The Sundowners," with great cast, good story, gorgeous scenery, is still slow and tame. No tension is ever present. I think how it will finally end is obvious rather early, but you will want to see it through, if only to test your judgment. Robert Sterling, a good-looking and talented actor, is not someone I had associated with Westerns, but he rides like a cowboy and seems absolutely real. Robert Preston has done everything, and I mean everything: He is probably still best known for "Professor Harold Hill" in "The Music Man" but he also was the wagon master in "How the West Was Won," and seemed right at home brandishing a whip and heading 'em up. Chill Wills can't do much wrong. (The ad campaign for him to win an Oscar for his role in "The Alamo" was a major exception, but maybe we can't blame him for that.) His character here is an example of great writing and he, as always, pulls it off perfectly. Cathy Downs is probably best known for the title role in the moronically a-historical "My Darling Clementine" (it is one my most disliked pieces of history twisting on film), and she died terribly young, 26 years after this film. She was a lovely and capable actress, and her character too was different and an example of good writing. Her character was the wife of the one played by Jack Elam, who had a different role for him. You might want to watch "The Sundowners" just to see Jack Elam in this unusual part, and to see how talented an actor he was. John Litel was a veteran performer, and always so believable, whether on horseback or as Thomas Jefferson or as the boss of the Secret Service. He is one of my favorite character actors -- which means one of my favorite actors. That writing, by the way, was by veteran Alan LeMay (known here as Alan Le May), perhaps best known for "The Searchers." God bless 'em, but Westerns on the Web has this available at YouTube and you should be quick to grab a chance to watch. At no time will you be on the edge of your seat, but you will admire the more than capable cast especially against some of the best scenery Texas has.